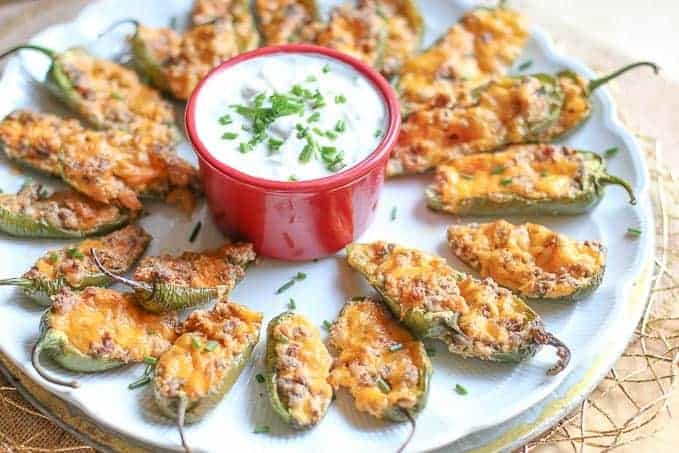 This Cheeseburger Stuffed Jalapeno Poppers recipe combines two of your favorite things; cheeseburger and jalapenos! They are easy to make and full of spicy flavor. They make the perfect party appetizer! I love a good jalapeno popper. I have to order them anytime I see them on a restaurant menu. The hotter… the better! I was craving jalapeno poppers at home and I had a box of juicy, tasty Chop House Steak Burgers in my freezer. 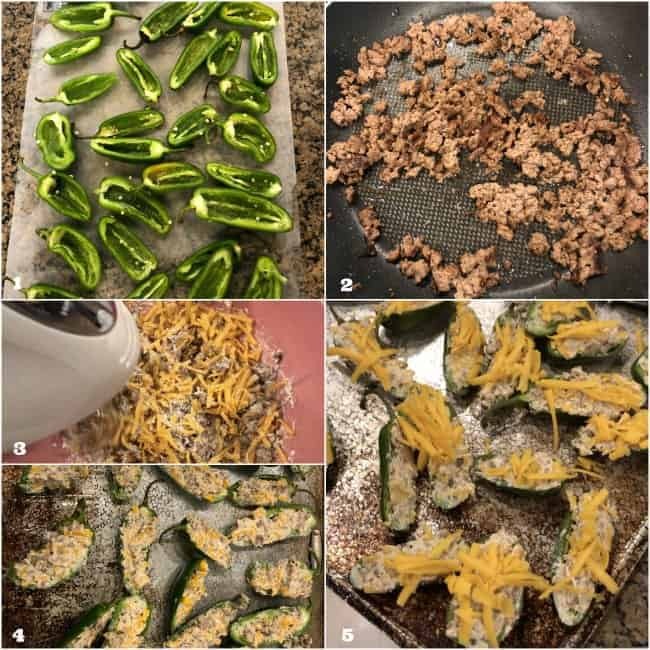 I thought, why not make cheeseburger stuffed jalapeno poppers? I mean… juicy burgers… cheese…. and jalapenos…. what could go wrong with that? Have you heard of Chop House Steak Burgers? They are the best thing you can find in your grocery store freezer!! I was kind of hesitant about them because they are found in the freezer section, but I was pleasantly surprised. They are made with USDA choice meat and are frozen raw. Just cook them to the temperature you like and you have one killer steak burger. My husband and I now keep them stocked in our freezer. They are honestly restaurant quality and perfect to have on hand for backyard cookouts or easy family dinners like my Salisbury Hamburger recipe. Try them yourself. You will love them! Split jalapeños in half. Hallow out all veins and seeds. Cook Chop House Steak Burgers and crumble the meat. Mix cream cheese, seasoned salt, and 1/4 cup cheddar cheese with cooked meat. Fill jalepenos with cheeseburger mixture. Spray baking sheet with a nonstick spray. Add jalapenoes. Sprinkle all the jalapenos evenly with remaining 1/4 cheddar cheese. Bake for 25 to 30 minute until cheese is completely melted. 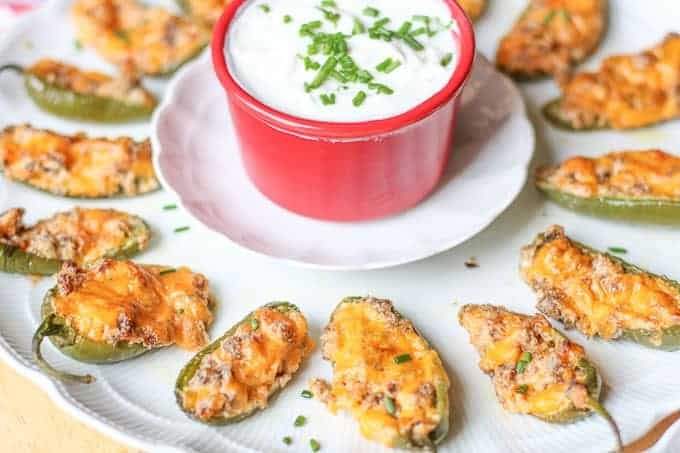 Serve the stuffed jalapeno poppers by themselves or with a side of ranch. Your friends and family will love them! Enjoy! If you like this recipe, check out: Cheeseburger Poutine, Brie Bacon Burger with Blueberry Chipotle Barbecue Sauce, and Cheesy Jalapeño Cheddar Beer Bread. 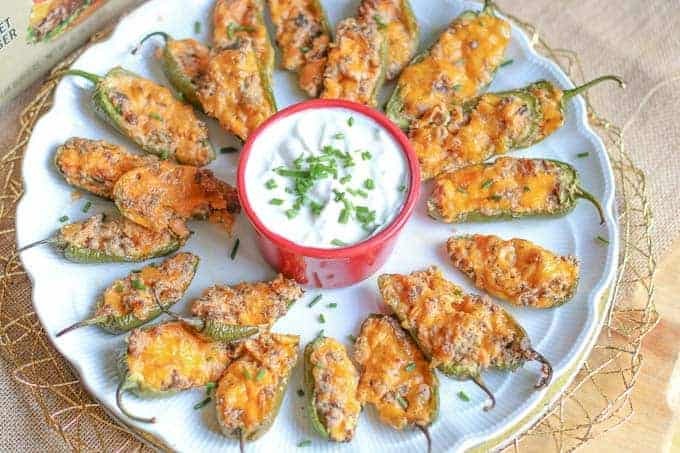 This Cheeseburger Stuffed Jalapeno Poppers recipe combines two of your favorite things; cheeseburger and jalapenos! They are easy to make and full of cheesy, spicy flavor. They are the perfect party appetizer! Spray baking sheet with a nonstick spray. Add jalapenoes. Sprinkle all the jalapenoes evenly with remaining 1/4 cheddar cheese. Oh my goodness! 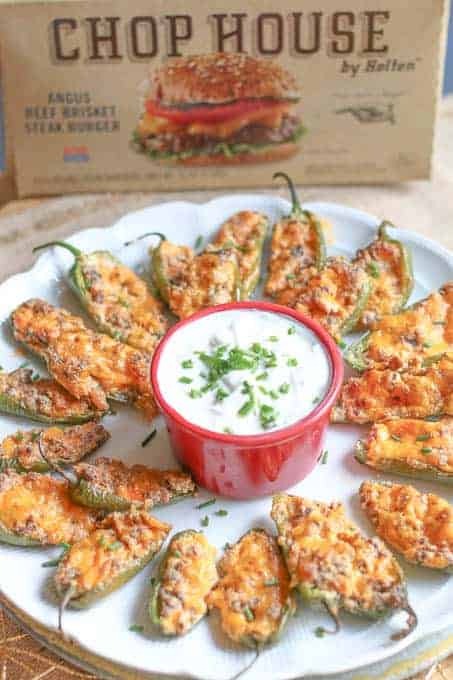 I adore stuffed jalapeno poppers and these look delicious, especially stuffed with cheeseburgers? Yes, sign me up and I’ll be making your recipe asap!